Thanks for visiting the Helens-of-Troy website. I hope you have as much fun with the Helens as I do. Currently enjoying my "Helen" years, I live in Vancouver, Canada, but originate from the centre of the universe (Toronto). I spent my "Ellie" years in a town called Mount Forest, also in Ontario. I am not thinking about my "Helena" years quite yet. I graduated from Humber College's Cinematography course many moons ago, and spent a few decades working in the Canadian Television industry (distribution). 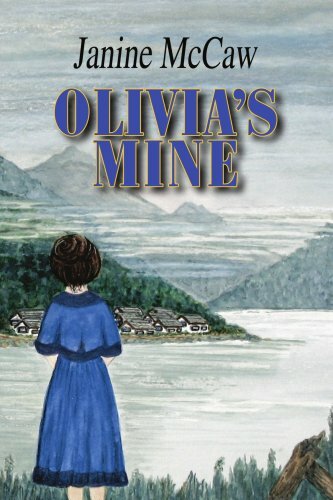 In 2006, I wrote my first novel, "Olivia's Mine" that is a fictional account of the disasters that happened at Britannia Beach (BC) in the early 1900's. You can purchase it in the gift shop at The BC Museum of Mining, or through Chapters, Barnes and Nobel or Amazon. If you live in Canada, you can most likely "check it out" through your local library. If you'd like know about other projects I'm working on, visit my website at www.janinemccaw.com. You can follow along with me as I write the book "PUMPER". I will try to answer your questions at Janine@helens-of-troy.com, but if there's a delay on my answer, my hubby Paul and I have most likely gone fishing. Historical novels set in British Columbia, especially ones for young adult readers, are rare, so new ones such as Olivia's Mine are always welcome. The novel's main character, Olivia Fitzpatrick, learns many life lessons when she follows her ambitious husband Frank, from Seattle to the mountainside copper mining village of Britannia Beach a short distances north of Vancouver. Olivia knows none of the 500 miners and their families at Britannia Beach when she arrives by steamship in 1912, but as she finds a way to belong and cope with disasters and miracles, the reader comes to appreciate the hardships, prejudices and joys of small town life only a few generations ago. Predictably the central characters are Caucasian and drive the plot, from mine boss John McMichael to Olivia's friends Lucy Bentall and Sarah Heiboldt, while those of other cultural backgrounds, such as Frenchie Cates, a Scots-etis, and the Yadas, a Japanese couple, whose son Jimmy is proudly Canadian-born, provide foils who are humorous and wise. The story belies the idea that nothing happens in a small town, as everything seems to happen at Britannia Beach in the decade Olivia lives there. There is a landslide, a fire, a cave-in and a flood-events which really did occur. Many lives are lost, including those of people close to Olivia. And though cultural groups live separately within the town and intolerance is considered normal (another fact of history) people pull together in many instances as Olivia discovers. Women play a traditional role on the surface, but Olivia proves there are windows of opportunities to take charge and this she does, despite her husband's unappealing fits of jealousy. Still these were paternalistic times, with miners fired "Donald Trump" style and no trade union in place. (The miners unionized after the Second World War). Alcohol and prostitution, in moderation, is toler ated as a release for the workers. These facts as well as mining safety concerns, such as miners' lung disease, are woven into the story but for the most part, the common working man's hardships are downplayed in favor of romantic intrigues. Despite all the town's disasters (not to mention the First World War and the Spanish flu epidemic), the author has a talent to deliver a happy ending as Olivia's determination and the towns peoples's strengths carry the day. -Janet Nicol, Vancouver B.C. is a high school history teacher and freelance writer.